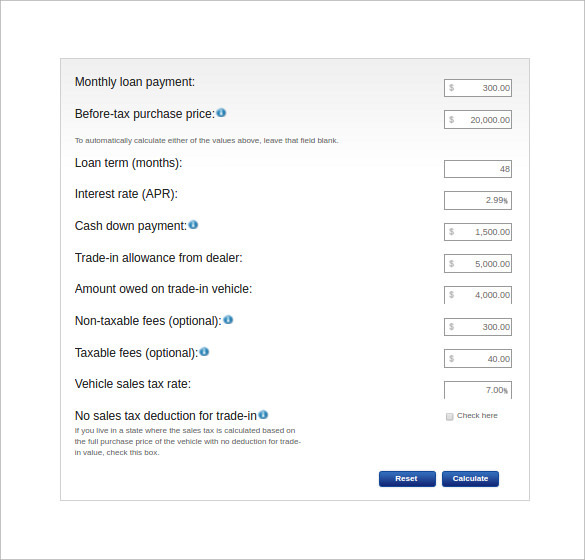 The format allows the user to calculate the amount of loan along with interest for the car you want to purchase. 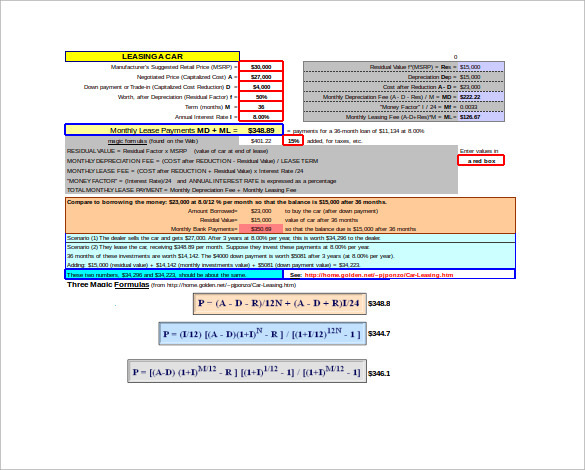 The calculator calculates the installments on reducing the balance. After purchasing the car, the owner has to pay the EMI at the end of the month and the amount can be known after calculating through the calculator. 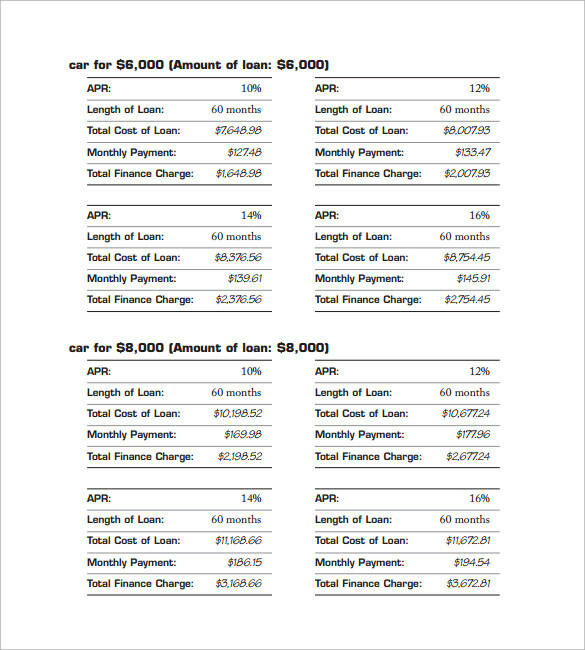 The worksheet calculates the total Loan Payment Calculator amount through the down payment, trade-in, cash rebate and other things. 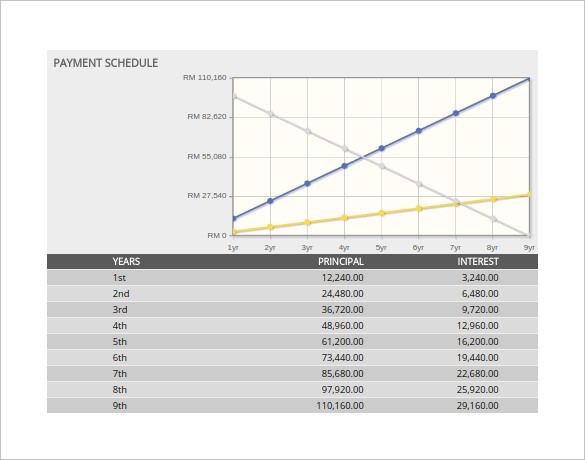 The calculator gives complete flexibility on making additional payments and keeping a track of the same. 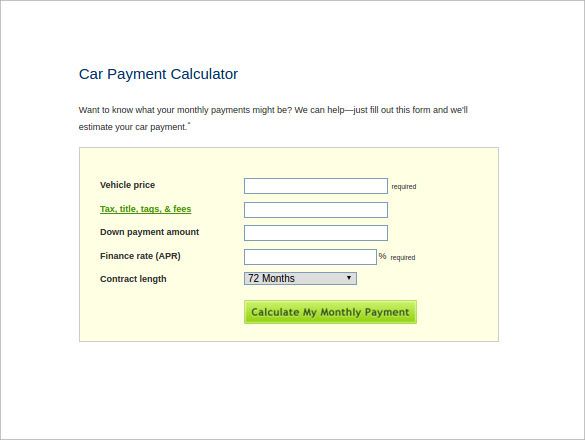 You can download the car loan calculator in excel sheet format from online. This option will be able to help you figure out how much you would be paying monthly, as well as the final cost of the car, including interest. It includes the state sales tax, cost of the car, rebate, down payment and more and once these are calculated your monthly payment would be estimated. This is the calculator that is used to determine how much the lease of a vehicle would cost you. It includes the suggested price, negotiated price, down payment, annual interest rate and more that helps to calculate the entire price, which is then split into monthly lease payments. 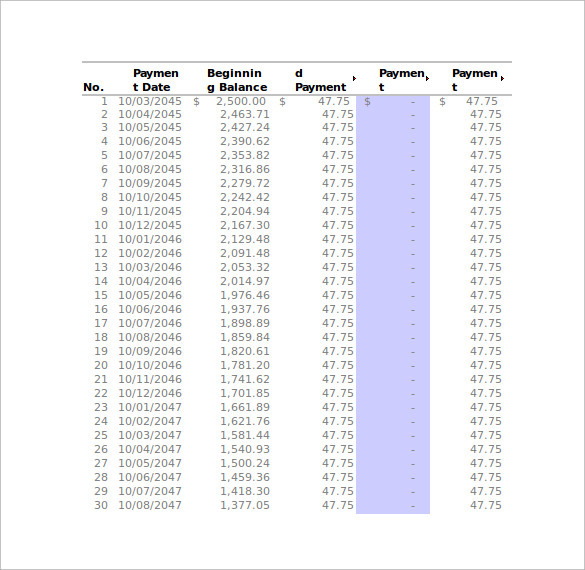 This excel sheet is something that you can create yourself. You simply need to start keeping track of the amount of the loan, including the initial amount, the starting date and the monthly payment. You will be able to see the balance decrease every month, which can help you to estimate how long you will be paying it off. These calculators can help you to determine just how much you can afford to pay on a monthly basis and how much car that will get you. You should look at this before you go to the dealership to know your budget so you can stick to it. It can help you to see how much you will be paying out in the end for the car, including taxes and other requirements.You can also see Sample Inflation Calculators. 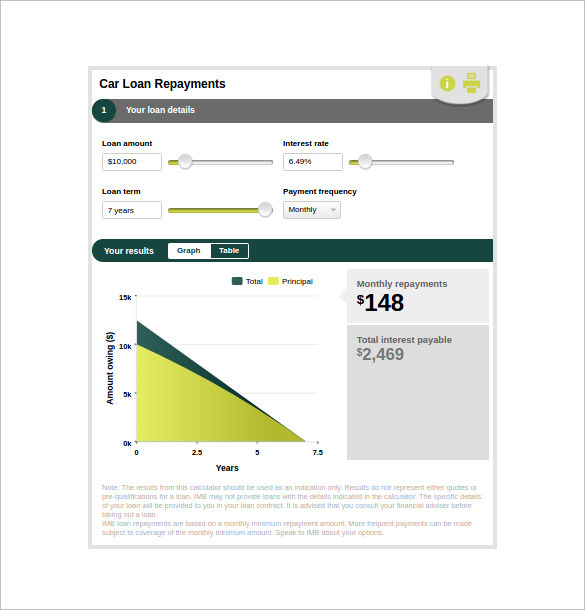 When do I need a Car Loan Calculator Template? If you are thinking of purchasing a car, whether it is a used or new one, then you should make sure to run your figures through the calculator first. Look at the costs of a particular vehicle, such as the one you want to buy, and put it into the calculator and see what the outcome is. Once that is done, then you can determine whether or not you would be able to afford it. Make sure to do this at least once before you head to the dealership. 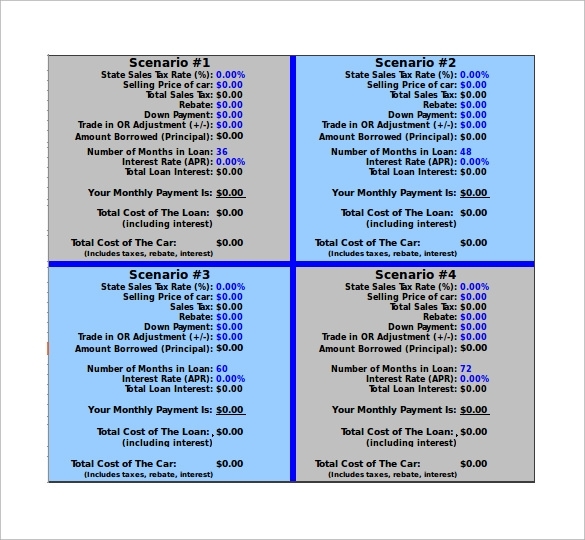 Why use a Car Loan Calculator Template? These are ideal because you can not only see how much you can afford when it comes to a vehicle, but you will also be able to see how much interest you will be paying. You can also use them to see how long it will take you will be paying the car off or what the effect would be if you increased your payment. This will help you to see how much you can afford and what price range you should be looking at. This is a great way to figure out how much you can afford to pay out, which means that you can have a set limit when you head to the dealership. You should make sure to input the figures before you head over there to ensure that you are only looking at the vehicles that you will be able to afford. You can also see Sample Income Tax Calculators.